Come into Crawford House to sign up for these open trips! Winter at Camp 4 starts February 13 through March 6, every Wednesday from 3:30-5:30 and Spring Camp 4 will be March 20 through April 24, every Wednesday 3:30-6:30. Mountain Challenge’s backyard will be open to MC students, faculty, and the general public for recreational exercise. You’ll be able to boulder in the climbing cave, climb the alpine tower, participate in a group fitness class, or design an individualized workout using our kettlebells and resistance bands. Read more here! Also…NO MORE CANCELLED WINTER CAMP 4’S! How can we be so sure we won’t cancel? We’ll use a ‘menu’ approach, choosing the exact activities 48 hours ahead based on conditions. How can you find out what the winter Camp 4 activities will be? 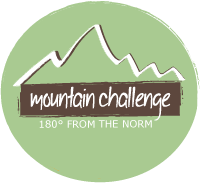 Like Mountain Challenge on Facebook and follow us on Instagram @mtnchallenge180! As part of the Bicentennial celebration this year’s bike trip will trace the likely route Isaac Anderson used to travel from SW Virginia to East Tennessee – all by the way of pedal power! The tour leaves Friday March 8 and will return Friday March 15! DON’T FORGET: FOR EVERY FIVE MOUNTAIN CHALLENGE OPEN TRIPS, YOU EARN ONE PHR CLASS CREDIT HOUR!